Your garage door gets a lot of usage on a regular basis. The average is twice per day, i.e. once when you leave for work in the morning, and once again when you get back in the afternoon/evening. That's over five hundred times a year. There's no wonder different parts of the machine start to break down after a while. Just take a moment to consider how much wear and tear the system accumulates. It's therefore very important to know how to recognize common issues that can occur, and what needs to be done to handle them. This will help you deal with problems quickly and save you time and money. One problem that often happens to this type of mechanism is the panels getting stuck while opening or closing. This can often be caused by the garage door hinges if they are not lubricated properly. The good news is that there is a relatively simple fix for this issue that can even be done using supplies sold at your local Walmart store. Just make sure to read your door's owner manual first to know which type of lubricant is best for your hinges, springs, and bearings. If the door won't open or close no matter how many times you push the button on your remote, you should check a few things to identify where the problem lies. The first thing to check is the batteries. You'd be surprised how often people forget about that. If that's not where the problem lies, make sure you can open your door using the wall switch to see if the opener is actually at fault and not the remote. If you're certain the issue is with the remote, it may need to be reprogrammed. Your opener's owner manual should have instructions on how to do that. However, if you're not sure, or if you find that doing that didn't solve the problem, our technicians can come and troubleshoot the issue. This is probably the most common problem you can experience, and also one of the most dangerous ones. There are also two types of springs that garage door systems can use - extension and torsion. Both types can be dangerous when mishandled, so you should not attempt to perform any repairs yourself. It's easy to tell when a spring broke because you'll probably hear a loud bang and your door will most likely drop suddenly. You'll find it very difficult to open it afterward, and you should avoid trying to do it until the damaged unit has been replaced. Again, you should never try to carry out the spring replacement work on your own, so give our team a call instead. 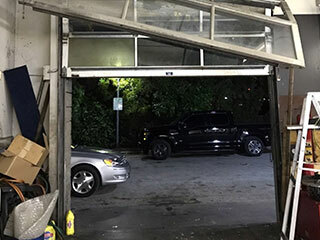 While there are some issues that you can handle yourself, remember that there are all sorts of problems that can be very dangerous, and you should leave them up to our experts at Garage Door Repair Irving. We're always ready to help.